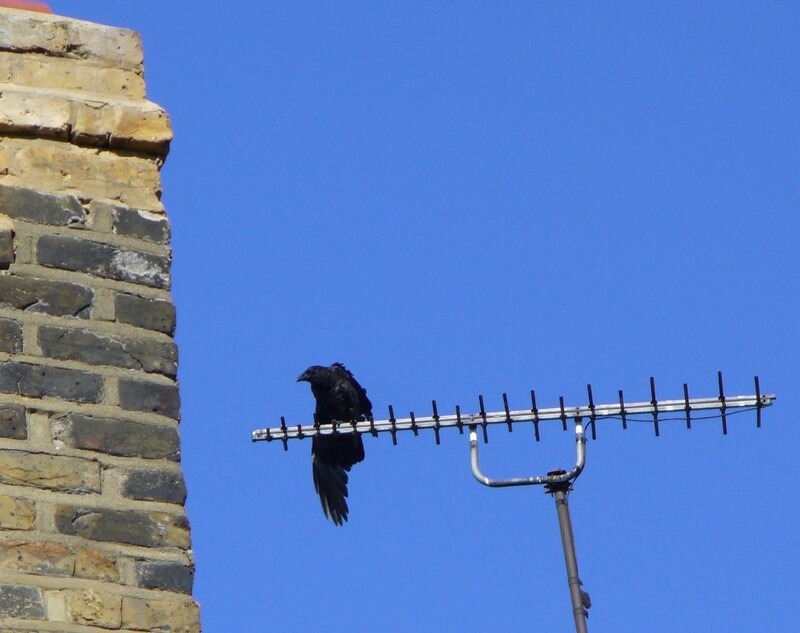 The cawing of Crows can be heard in Highbury, coming from roofs, trees, chimney pots & television aerials. 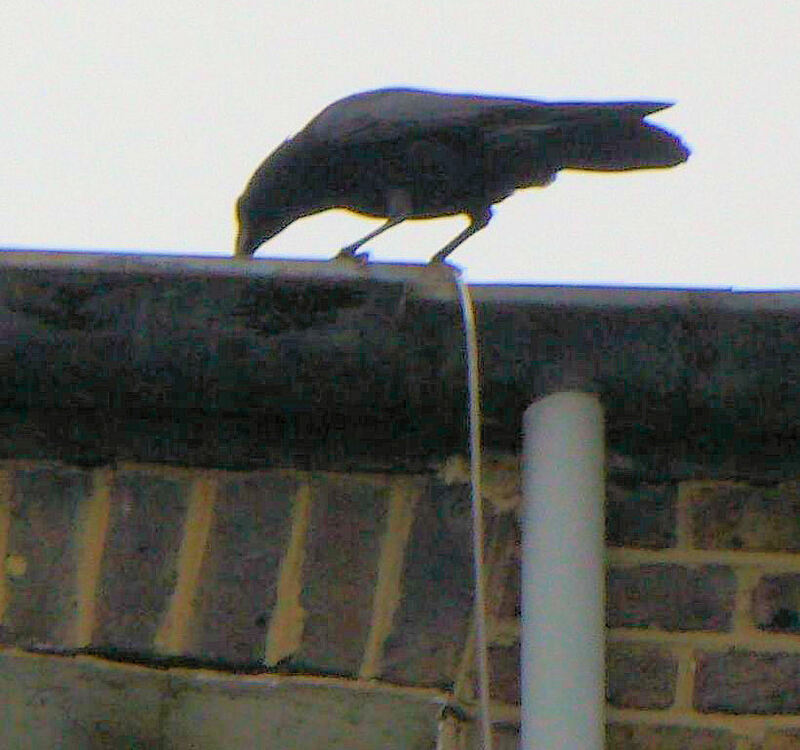 Food dropped by football fans on Matchdays – from sandwiches, fish & chips, burgers & pizza – make this a good neighbourhood for the omnivore Crows. They manage to find enough other provender to keep them going on non-Matchdays. 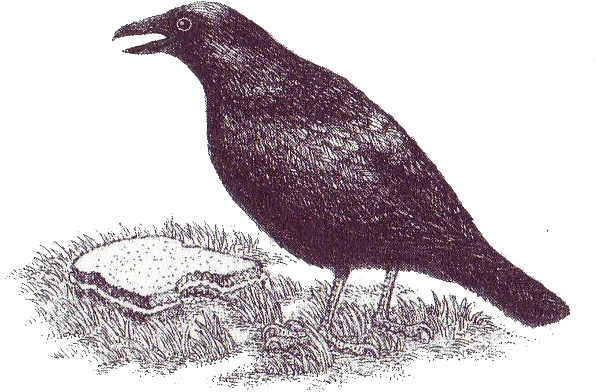 ‘…the role played by crows is a vital one, if we are not to be knee-deep in carrion and discarded sandwiches‘. 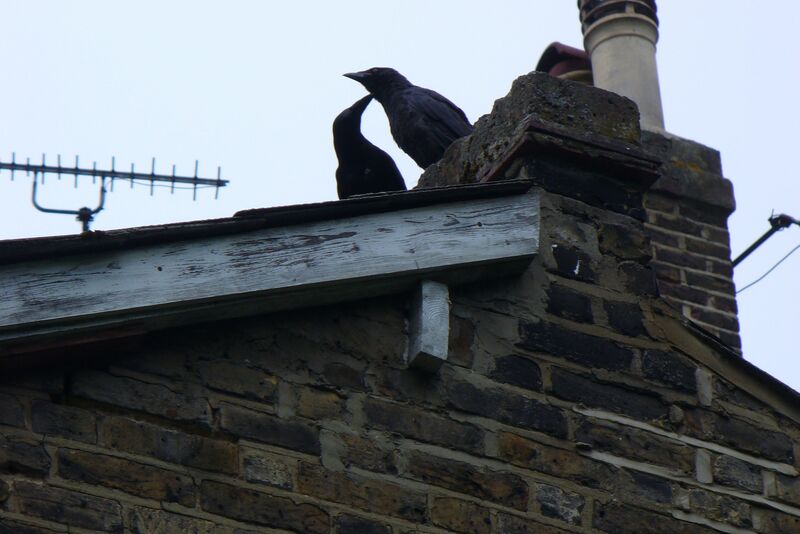 On the week of the Summer Solstice, 2013, a noisy young Crow is being taught in Crow School by its parents. 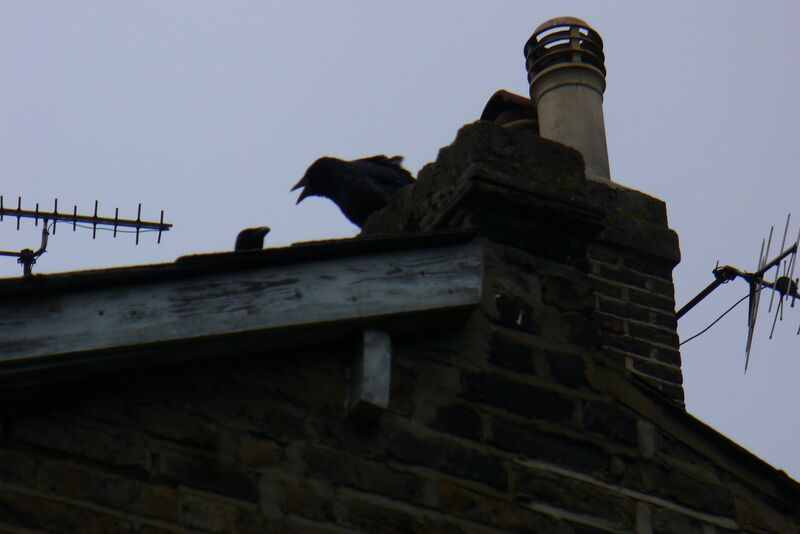 The loudest bird in this neighbourhood was always the Chief Crow. There was a great roar & a snarl in his caw. 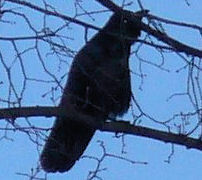 In 2001, the Chief Crow performed his courtship ritual at the top of the old Elder tree, level with my window. There followed eggs, chicks & the fledging of young crows, with the entire performance played out again the following spring. 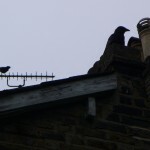 Crows mate for life, say the bird books, & I assumed a similar ritual would take place, year on year in the back garden treetops, every springtime. Never take these things for granted. 2003 was the last performance, as an avaricious developer moved in, trashing & burning everything in the back, including the old Elder tree where the Chief Crow performed his courting dance. If I had had access to a video camera, there would be something to see here. But now the Chief Crow’s tale can only be told as a story. It was spring, 2001. 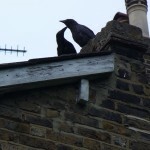 North London streets echoed to the harsh calls of Highbury’s Chief Crow. He sat on the high metal struts over Highbury Stadium’s North Bank, his back to the football ground, proclaiming himself loudest & mightiest of all the Crows. On Matchdays, over 38,000 humans crowded into the Stadium to watch the game. The noise THEY made billowed, deep and loud, out of the stands & round the neighbourhood streets. On Not-Matchdays there were only a few groundskeepers about, tending the grass of the Perfect Pitch, the finest in all of Europe. The Stadium then was a vast, quiet, empty space. 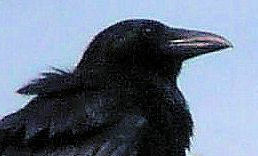 The voice of the Chief Crow, whose name was Haak, sliced through the air, backed by the empty stadium. Only Concorde, the very BIG metal bird which passed overhead twice a day, was louder than he. Spring was the time of courting rituals for birds & other creatures. 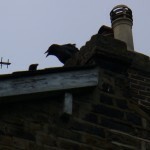 The Chief Crow, though many years mated with his consort Ing, was keen to begin. 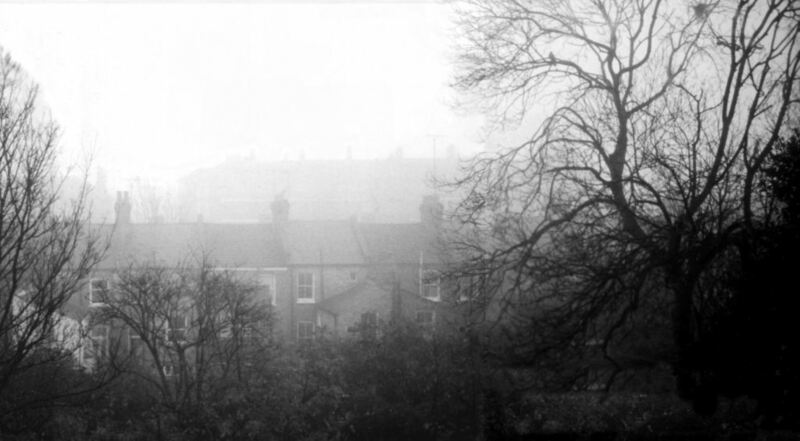 He left the North Bank superstructure, gliding smoothly & silently out over the street, the terraced houses & their back gardens. There below him was the old Elder, his courting tree. The Elder had grown as tall as an Elder can grow. But still it brought forth its white blossom discs each spring, & many dark berries later in the year. Its topmost branches on one side had given up making leaves, & their wood was now dry and brittle. They leaned against one another when the wind blew, making soft, woody, creaking sounds, as if the Elder were speaking. The Chief Crow hovered over the Elder, dropping down onto one of these dry, leafless branches. 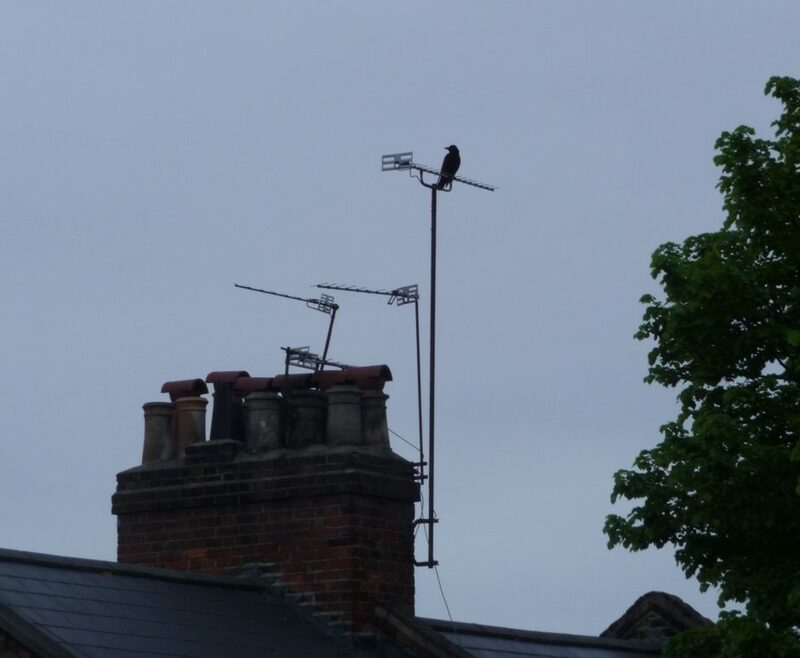 He looked across at his mate Ing, perched at the top of the great Ash. He bowed to her, raised himself to his full height & rasped out four loud caws. He stretched his wings wide & snapped them shut, fanning his tail. Then he walked a few steps along the branch, first one way & then the other, & dipped his head. Again he spread his wings & tail, again he bowed. Then he leaned down to a dried branch, clamped his beak round it & pulled back. There was a loud crack as it broke away from the Elder. Haak bowed again to Ing, the broken branch clamped in his beak. He waved it about & rocked from side to side, opening & closing his wings & tail. Then, with the branch in his beak, he spread his wings & lifted up into the air, gliding over to Ing on the fork of the Ash. 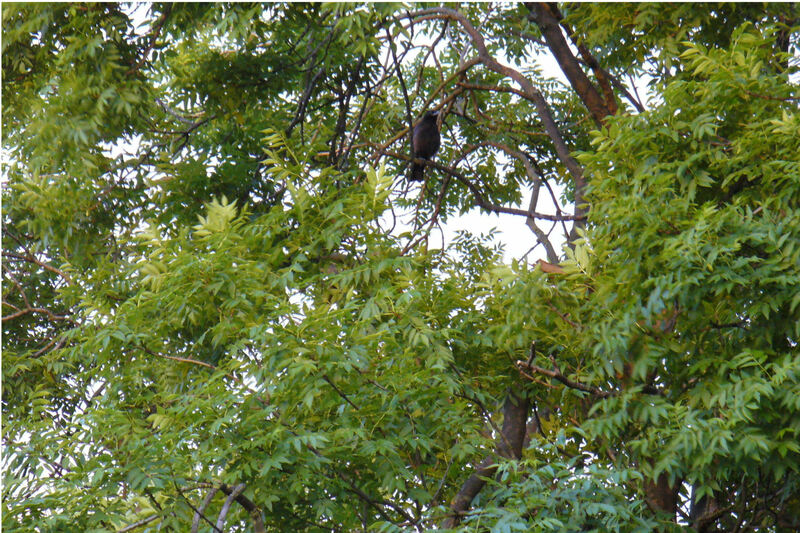 He landed, bowed before her &, tilting his head, looked up & offered her the Elder branch. Ing looked at it. Such a present! It must surely be the finest branch any bird had ever given another! And presented with such ceremony, such dancing! Of course she would accept it! She leaned forward & took it in her beak, pressing it against one branch of the Ash, then another. Where should it go? In the end, the auspicious first branch for the new spring nest was carefully placed in the same fork of the Ash that had held last year’s nest. Much companionable preening & beak-butting between the Crows followed. This reinforced their ties to each other & marked the new season’s nestbuilding & egglaying. All was well with their world. Haak and Ing built a new nest in the Ash every spring. 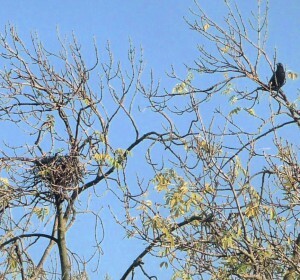 They mated in it, had eggs, raised baby Crows & left the old nest to blow away in the winter storms. In summer they used the Ash as THEIR TREE, chasing away any birds who had the temerity to land in it. 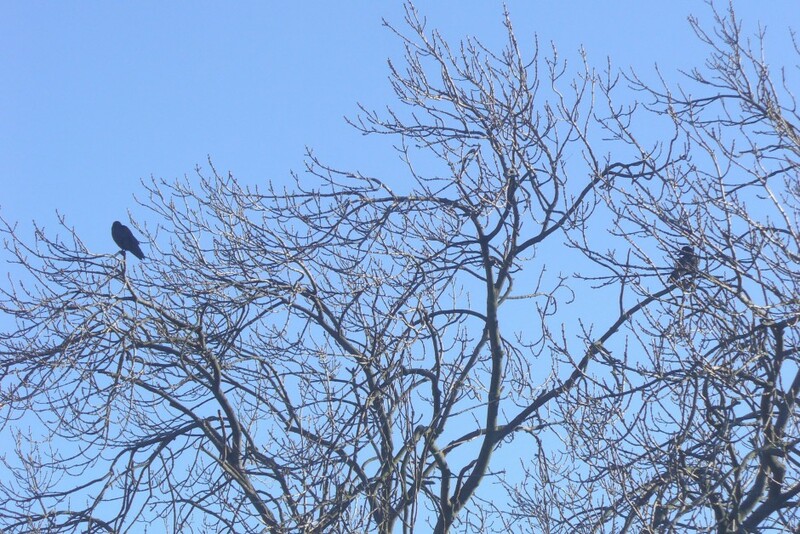 At times their cousins, the Magpies, seemed to be playing a game – landing in the Ash & perching on the outer branches, daring the Crows to chase them away. 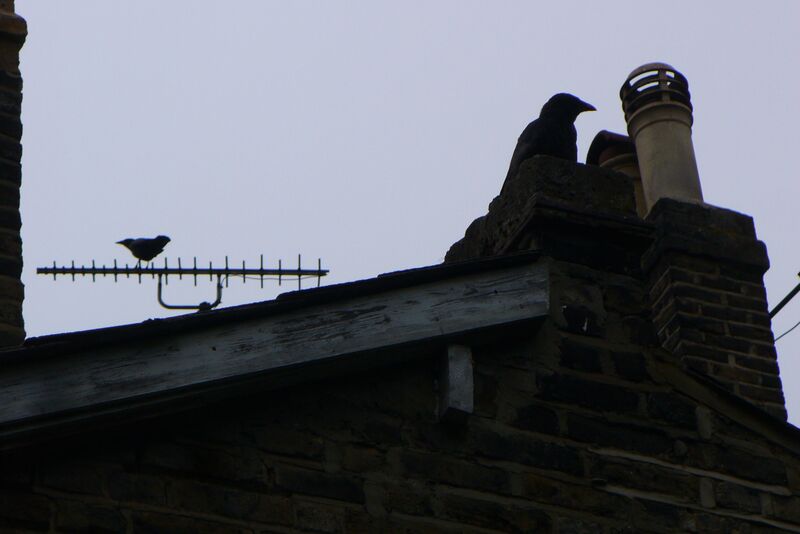 However persistent the Magpies, the Crows saw them off again & again. Was it not obvious? This was a CROW TREE. 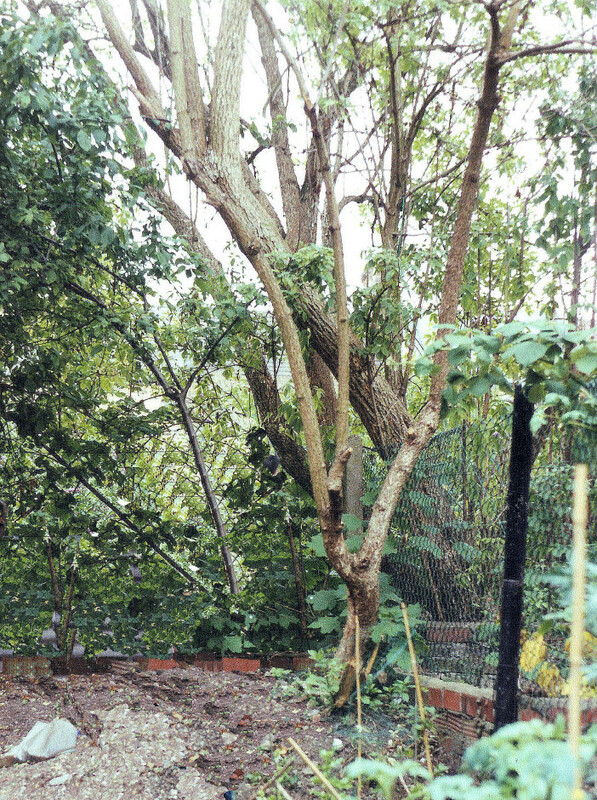 In 2003 the old Elder tree, with surrounding wild Buddleia, mature Sycamores and other trees in the little woodland behind our houses, all were chopped down by a Property Developer, Paul Simon Developments Limited, who had bought the land. It happened over a Mayday Bank Holiday. Neighbours joined together to fight the developer. After much time spent & aggravation endured, a Public Enquiry was held in Islington Council’s offices. It found against Paul Simon. But it was no help to the wildlife, who had all suffered losses – birds, foxes, small rodents, minibeasts, insects… And the Crows’ Courting Tree was gone. 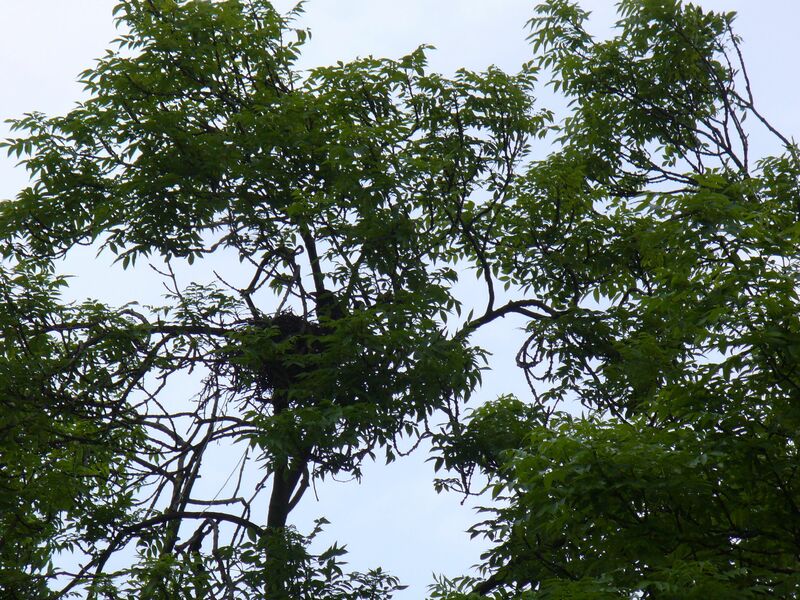 Haak & Ing found twigs & branches for subsequent nests from elsewhere, as nests were built in years to come – new nests in the Nesting Tree. But we have missed the sound of the old Elder and the sight of the Crows’ courtship dance. 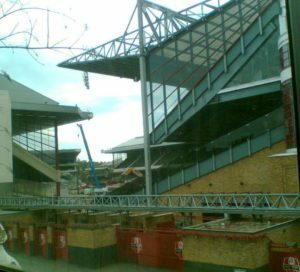 In 2006, after Arsenal’s new Emirates Stadium had been finished a few streets away, the team abandoned the old Highbury Stadium. 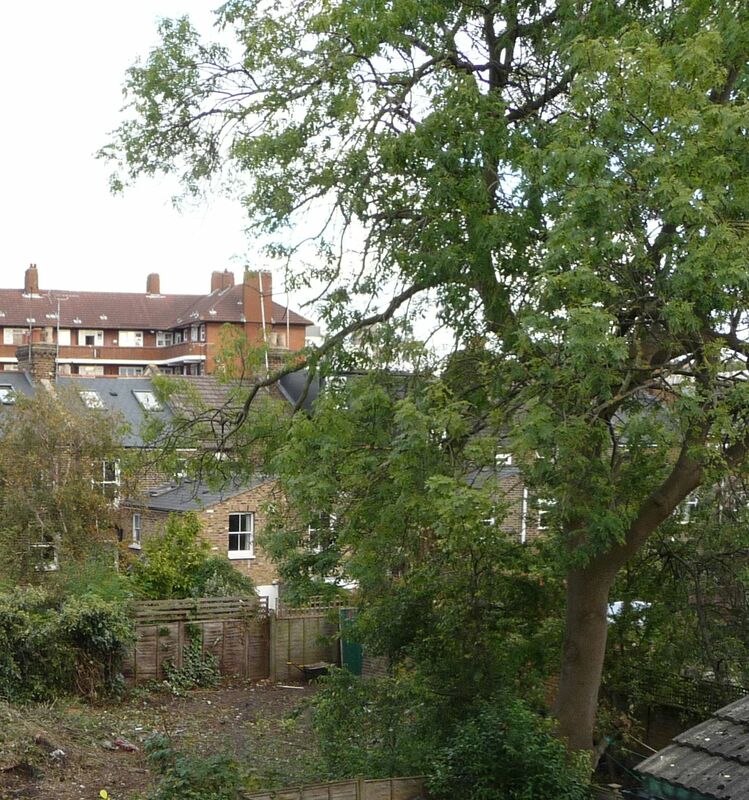 It was given over to McAlpines, to be pulled down and made into flats. Demolition began some time after the last game in August & carried on for several years. On Saturday 6th November 2006, Matchday at the new Emirates, a helicopter hovered over the gathering fans around 12.30 near kick-off. 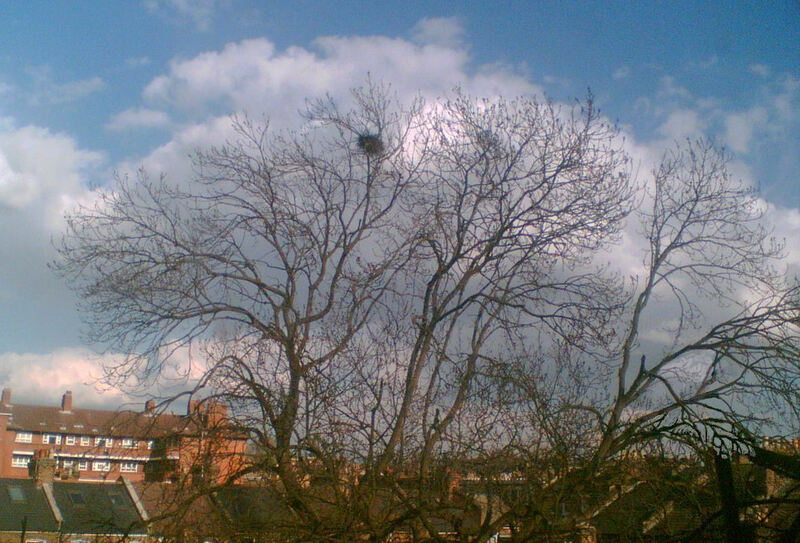 Two crows were in the air as well, flying together over the old Highbury Stadium. They dipped down over Haak’s old proclaiming perch to show respect, then rose up & flew on. Since that day they have taken to perching on the new flats which replaced Highbury Stadium. 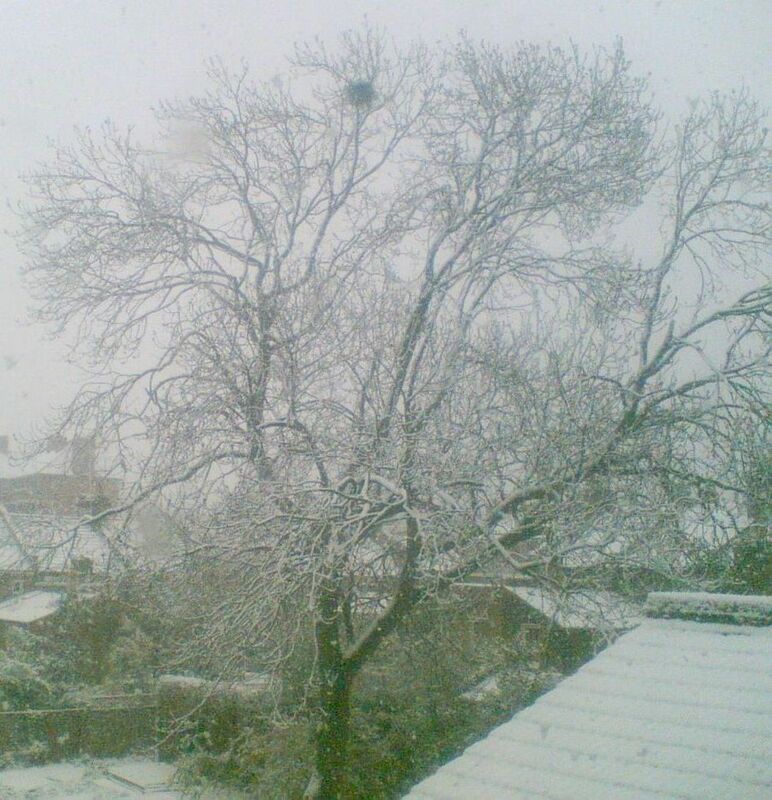 Behind the terraced houses, the Crows’ nest blew away as usual that winter. 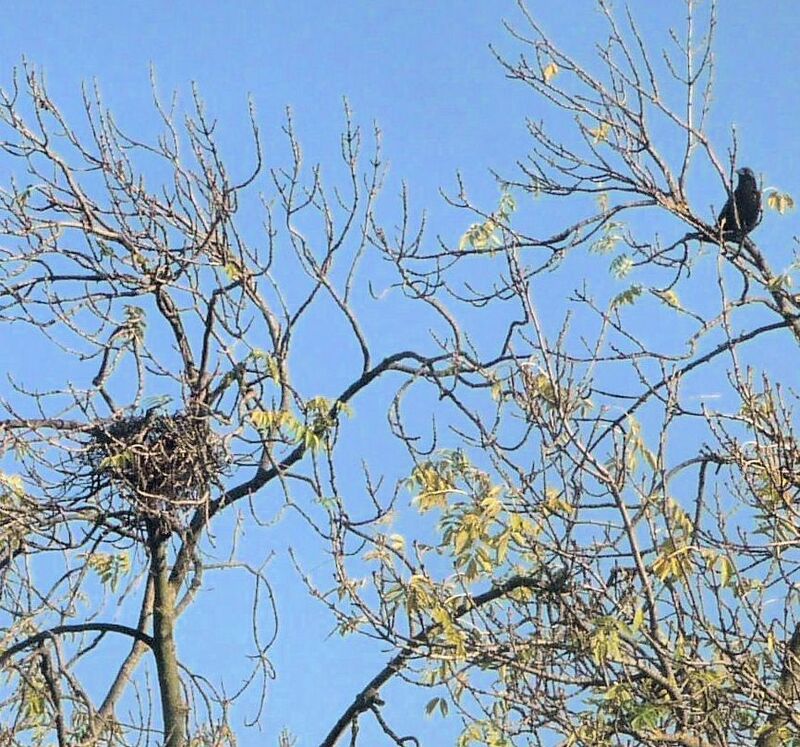 In 2007, after another successful season with eggs hatching in a newly built nest, & new baby Crows on the scene, the Crows’ nest did NOT blow away in winter. In the Spring of 2008, sticks were added to the old nest, there was courtship & mating, & eggs were laid. The same as it ever was, but without the hatching of the eggs. A Crow sat waiting, watching, getting up, peering into the nest, rolling the eggs round again, yet more sitting… Both Crows together stood over the nest, looking into it for signs of life… But the eggs did not hatch. Days went by, a week… And the nest failed. Disease? Parasites left in the old nest that hadn’t blown away? Eventually Haak and Ing deserted the nest in the Ash. 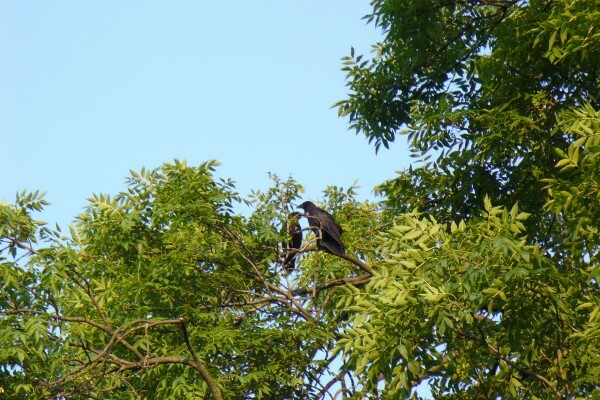 They may have set up a new nest in another tree; a young Crow was seen flapping & begging for food at the Crows’ nest in mid-June, but there was no sign of the parents returning to it. 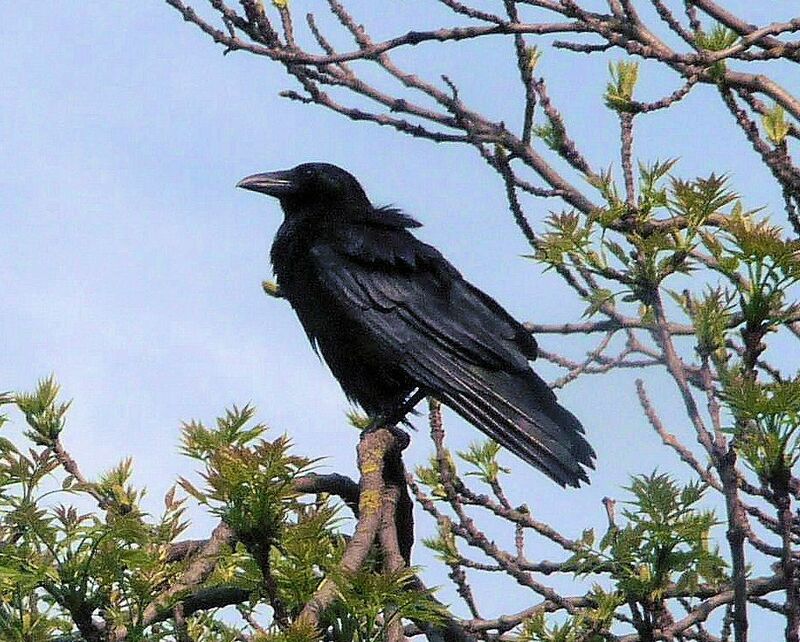 Crows may live for over 19 years & seldom move more than a few kilometres from their nests. The RSPB Handbook of British Birds, Peter Holden & Tim Cleeves, 2002, Christopher Black, imprint of A & C Black. 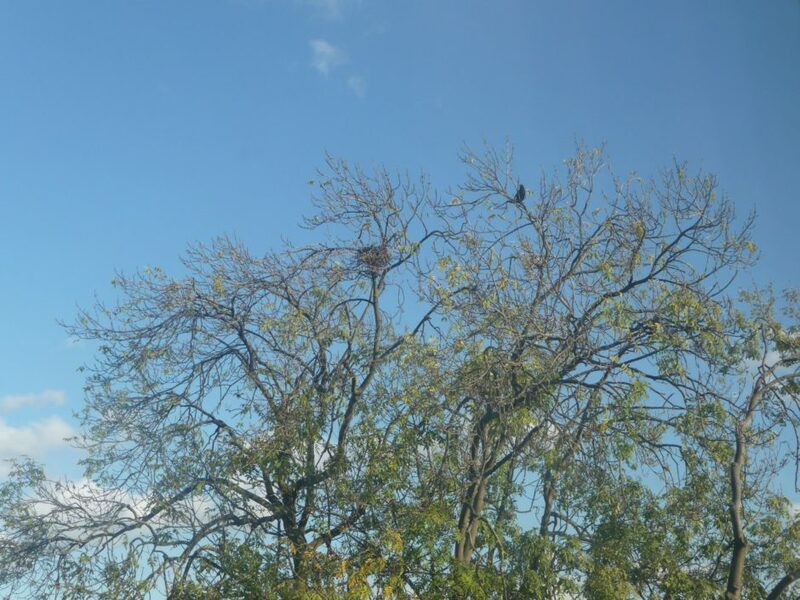 So it appears that our many Highbury Crows could all be part of an extended family, with Haak & Ing perhaps as Patriarch & Matriarch, now divorced. Another pair of Crows set up a nest a few years ago, in the same crook of the Ash that had always been used by the Chief Crow & his Consort. 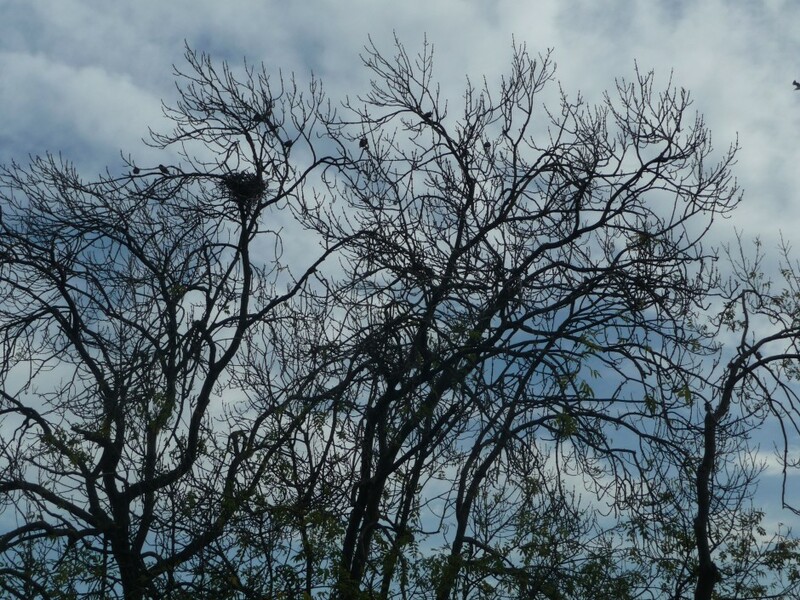 It was not a solid nest – you could see the sky through parts of it. 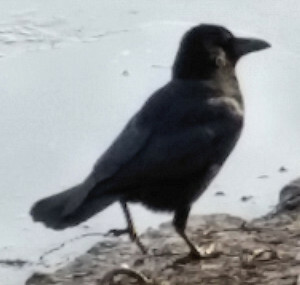 We thought they were only practicing, but they managed to raise a few young Crows that one year… The Ash is still primarily the Crows’ tree, but nowadays they only land in it, perch on it & caw from it.